Single and 3-day tickets for New York Comic Con went on sale Thursday at noon, and although ReedPOP reassured fans that they took the necessary steps to make sure purchasing tickets went as smoothly as possible, it did anything but that—crashing the website entirely within seconds. When it comes to buying tickets to conventions, nothing is as stressful, and with New York Comic Con vastly growing to the size and popularity of San Diego Comic Con, it wasn't long until we saw the same repercussions. Shortly after noon, the New York Comic Con website crashed due to the overwhelming traffic, landing users on a blank page with "Not Found (Error to Origin)." 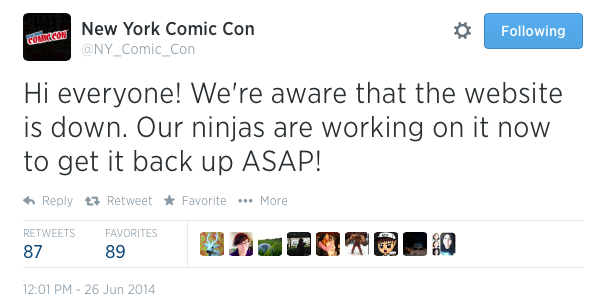 In an effort to quickly fix the issue, NYCC tweeted a direct link to ShowClix, the ticketing platform which remained—for the most part—working. NYCC's virtual queue was a valiant attempt at accommodating the growing high demand in tickets. The queue automatically brought you to the tickets page when it was your turn, although the approximate wait time in the queue was at least an hour, and many people were directed to more error pages when buying tickets. If that wasn't stressful enough, many fans were frustrated when they were forced to purchase single day tickets separately after the system said 3-day passes were sold out, even though others were still able to purchase them (I was able to after I refreshed the page). Lance Fensterman, Global VP of ReedPOP that puts on the convention, acknowledged the system flaws, leaving a long apology statement that addressed major concerns and questions from fans. "This is the identical ticket system we used last year," he wrote on Facebook. "The fact is that the demand for tickets was on a greater scale than even we did not imagine. For example, last year 4-day tickets took over 8 weeks to sell out, this year they took 40 minutes. The simple fact is that there is an extremely high demand for a limited supply of tickets." He also went on to address the complaints of scalping as ticket scalpers acted fast, purchasing the maximum 6 tickets per order. Three-day passes quickly made it onto eBay and StubHub, selling for 400 times the original price. "We have contacted eBay and they will not do anything to help us ban these sellers and in almost every instance, the sellers contact info is blocked. We will continue to pursue these one by one but when demand outstrips supply, capitalism dictates that someone is going to find a way to meet that demand." The 8-year-old East Coast convention has reached San Diego size, with an estimated 130,000 people in attendance last year. SDCC, which has been notorious for selling out within minutes, eliminated their 4-day badges this year. It seems like NYCC should take the cue from its West-coast counterpart, adding an ID system that enables loyal fans to purchase tickets ahead of the general public with a code from the previous year's badge. Aside from this year's ticketing mess, ReedPOP expanded the pop-culture convention for a 10-day New York Super Week. A $10 Super Week Card (sold separately, unless you purchased a 4-day pass) will get you into all the events, which already sounds worth the hassle. 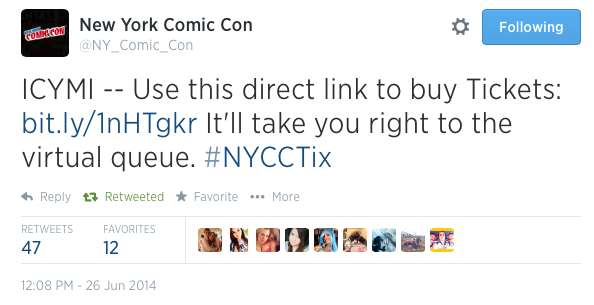 Were you able to purchase your NYCC tickets? Still aggravated and need to vent? Let us know in the comment section below!